First, my most recent CSA delivery. Fennel again! Ugh. While it is an interesting challenge to find ways to use all the fennel, I think I’ll be happy when it’s no longer fennel season. When Cyn mentioned in a comment that fennel was good on pizza, I tucked that info away for the next time I got fennel. I spent quite a bit of time figuring out how I could go from what would be pretty good pizza to a fancy “wow” meal. This stromboli took longer to make than I normally like to spend on dinner. I wanted to coax some complex flavors from the ingredients, and in the end the results were worth the extra time. Heat 1 Tbs olive oil in a wide skillet. Add sliced onions and turn heat to low. Cook for 35-40 minutes, stirring often, until onions are browned and caramelized. Meanwhile, line a baking pan with foil. Add the shaved fennel, portobello, 2 Tbs olive oil and 1 tsp kosher salt, and stir to combine. Roast in the oven for 20 minutes, stirring once after 10 minutes. When vegetables are cooked, remove them from the oven and increase the temperature to 450 F.
When onions are cooked, transfer them to a bowl. Place the almonds in the food processor and process into fine crumbs. Pour almond meal into the pan used to cook the onions, and toast over medium heat for a few minutes, being careful not to burn. Put the onions in the food processor with the 1/4 cup water, and process until smooth, scraping down the sides as needed. Add the garlic and red pepper flakes to the almond meal in the pan and cook, stirring constantly, for 30 seconds. Pour in the white wine (it will sizzle), and stir, scraping up any bits from the bottom of the pan. Add the onion puree, maple syrup, nutritional yeast and salt and stir to combine. Cook just until heated through. On a floured surface, roll out the pizza dough into a large rectangle. Spread the onion sauce all over the crust, leaving a 1-inch border along the long ends. Sprinkle the fennel and portobello mixture evenly over the crust. Starting from one long end, roll the crust up tightly. Pinch the crust together to seal. Transfer to a baking sheet, seam side down. Bake the stromboli for 17-18 minutes, until the crust is brown and crispy on the outside. As soon as the stromboli goes in the oven, put the balsamic vinegar in a small saucepan and bring to a simmer. Reduce the heat to medium and simmer until reduced into a syrup that coats the back of a spoon. Remove from the heat. 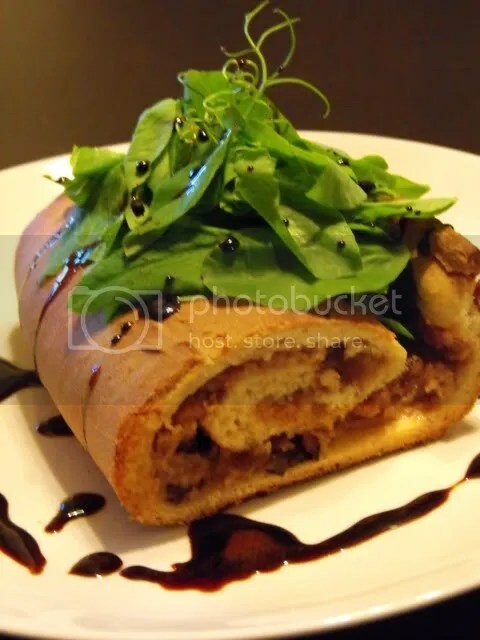 When the stromboli is cooked, slice it, top with pea shoots and drizzle with balsamic reduction. Note: This keeps well overnight. Just reheat the stromboli in the microwave or toaster, and heat up the balsamic syrup to loosen it up. As soon as I saw that I had romaine lettuce, I knew I wanted to make the Caesar Salad from Veganomicon. It’s so, so good and I just happened to have bought a big bottle of capers a few weeks ago. I LOVE this dressing. 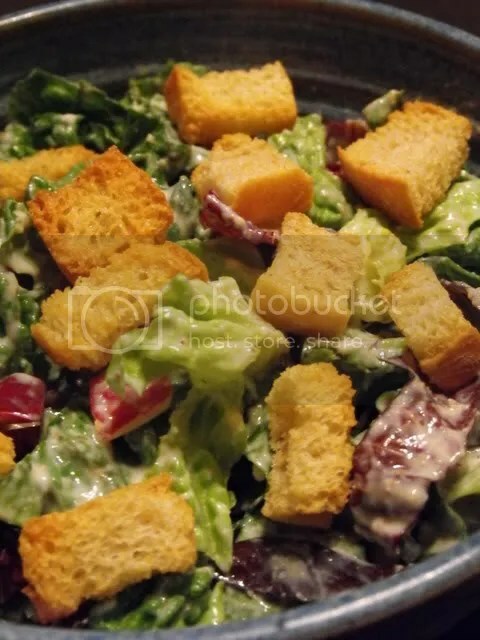 I used store-bought croutons and threw in radicchio, just to use it up. What a great salad. I also ate it as a “chicken” caesar salad wrap, in a multigrain tortilla with some cut up soy nuggets. 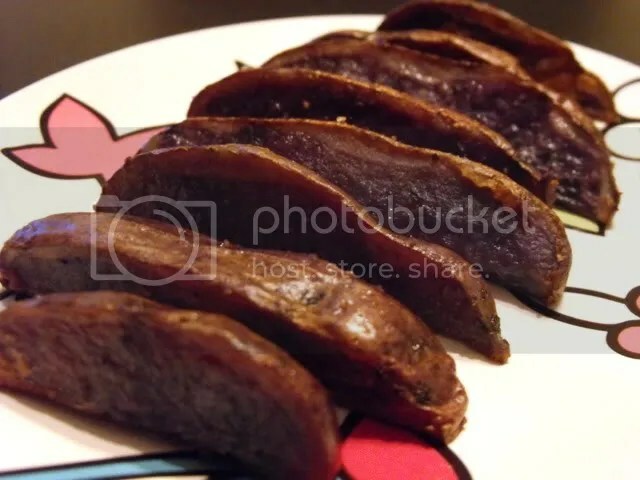 To go with my salad, I cut the purple potatoes into wedges and roasted them. While these were good, I think I preferred the first time I ate purple potatoes, when I had them mashed with gravy. Looovely produce, potatoes, and stromboli!! oh my goodness, Erin – your stromboli looks absolutely amazing – and it sounds sooooo awesome, too! mmmmmmm! way to use up some fennel, too – i’ve never cooked with it before, but we may have some coming with our CSA goodies here in april. totally going to have to make your stromboli then! wow! hooray for some pretty ‘n purple potato wedges – and isn’t the vcon caesar dressing the best?!? dan & i love it sooo much! your artichokes look awesome & i’m all about those collards ‘n kale! yay! Holy yumminess! Wow, your stromboli really is fancy “wow” meal! I always enjoy checking out your CSA goodies! omg that stromboli looks so good! how creative. you got artichokes?? i’m jealous. 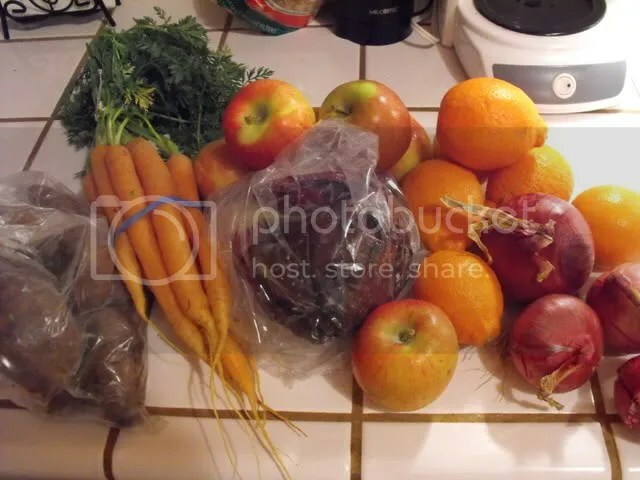 Wow–everything looks so good, including the produce! Would you recommend VWAV as a cookbook? I’ve had my eye on it for a while but can’t decided if it’s worth buying. All of the vegetables look fabulous. There is nothing better than a whoooole lot of fresh veggies! That stromboli is such a show stopper. Amazing! 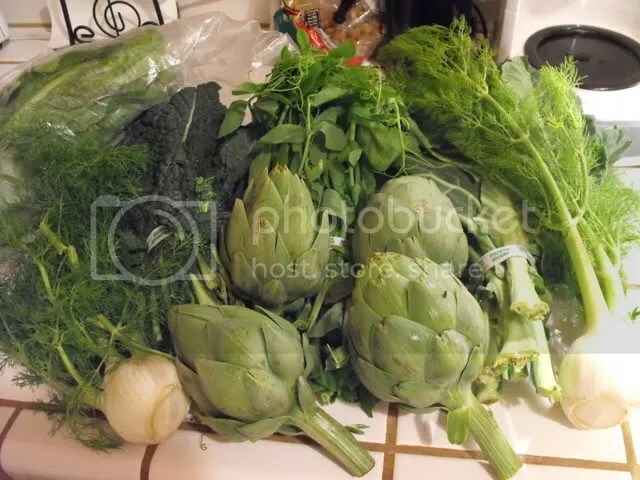 The fresh produce looks so good…..love that caesar salad! Wow, that is one special stromboli! I like the idea for the combination of flavours. Wow, that stromboli looks amazing! I love that you didn’t try to go cheesy at all with it; it sounds delicious. Wow, that is totally fancy. I like that you used balsamic vinegar, I think that vinegar balances out fennel in a nice way. That sounds really delicious. This has to be one of the best pizza/stromboli recipes I’ve ever seen! It is indeed special. What a fantastic meal. I have some fennel too, as it was cheap at the store. I’m struggling to use what I bought, so I’m going to have to give that recipe a go. I love fennel roasted or in an Italian-style (minestrone-esque) soup. I sautee the fennel along with an onion and the fennel becomes sweet and lovely (I then proceed to add tomatoes, whatever veg or beans I have on hand, and some small pasta. YUM). ooooh, stromboli! that looks wonderful! i’ve never cooked with fennel before, but i’ve heard it’s really good roasted. does it get the same effect in this dish? and yum on the ceasar salad! i’ve only made the ceasar dressing recipe from the uncheese cookbook, but i’ve been meaning to do the one from vcon because, girl, i LOVE capers. nom.